Introduction. References. 2. 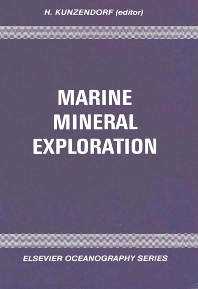 Marine Hard Mineral Resources. Introduction. Physiographic provinces of the ocean floor. Marine Hard Mineral Occurrences. References. 3. Research Vessels and Submersibles. Introduction. Statistics of research vessels and submersibles. Requirements of research vessels. Navigation systems. Examples of ocean research vessels and submersibles. References. 4. Marine Geophysical Exploration Techniques. Introduction. Acoustic surveying techniques. Seismic exploration methods. Marine gravity measurements. Marine magnetics. Heatflow measurements. Visual inspection of the seafloor. References. 5. Marine Geochemical Exploration Methods. Introduction. Marine exploration sampling devices. Analytical methods in marine mineral exploration. Geochemical exploration examples. References. 6. Data Evaluation of Exploration Surveys. Introduction. Data collection and storage. Data structure analysis. Data representation. Data interpretation. Conclusion. References. 7. Marine Mineral Exploration Examples. Introduction. Metalliferous sediments: The Red Sea. Massive sulfides at the East Pacific Rise. Deep-sea manganese nodules in the equatorial Pacific. Cobalt-rich crusts of Pacific seamounts. Phosphorite concretions off New Zealand. References. 8. Legal Aspects of Marine Mineral Exploration. Introduction. Areas within national jurisdiction. The area beyond the limits of national jurisdiction. Conclusion and prospect. References. Appendices. Index. The past 20 years have seen extensive marine exploration work by the major industrialized countries. Studies have, in part, been concentrated on Pacific manganese nodule occurrences and on massive sulfides on mid-oceanic ridges. An international jurisdictional framework of the sea-bed mineral resources was negotiated by the United Nations Conference on the Law of the Sea (UNCLOS III). A most important outcome of this conference was the establishment of an Exclusive Economic Zone (EEZ) of at least 200 nautical miles for all coastal states and the recognition of a deep-sea regime. Mineral deposits in EEZ areas are fairly unknown; many areas need detailed mapping and mineral exploration, and the majority of coastal or island states with large EEZ areas have little experience in exploration for marine hard minerals. This book describes the systematic steps in marine mineral exploration. Such exploration requires knowledge of mineral deposits and models of their formation, of geophysical and geochemical exploration methods, and of data evaluation and interpretation methods. These topics are described in detail by an international group of authors. A short description is also given of marine research vessels, evaluation of marine exploration examples; and an overview is provided of the jurisdictional situation after UNCLOS III.